Hey! You’ve made it to the end of this couponing 101 course. Congrats!! Now, you must get out there and try one deal. Since not all deals are made equal (some are more complex than others), I recommend that you find an easy deal that you fully understand, gather the coupons needed (if any), go out there and give it a shot. I still remember my first couponing trip. I was so nervous, I was shaking! I must have walked through every aisles of the entire store 3 times before I had the guts to go checkout. LOL! True story. I was scared to make a mistake, scared they would refuse me, scared I will screw something up, etc. 🙂 But I made it out alive, and from that point on I was hooked! Some hot deals (ones that many people desire) may not be the best deals to try as your “first run”, because they may likely be all sold out and I don’t want you to leave disappointed. 🙂 So, if you had planned on doing a hot deal, keep in mind that it may be sold out and prepare to have a backup deal to do. For your first run, I would avoid Walgreens just because it tends to be more complicated than other stores, especially to a newbie. If you have a Target, that’s a good store to start. I’m not saying don’t go to Walgreens. In fact, if you understand it based on our tutorials, there’s a hot Walgreens deal, and you feel up to the challenge, then do Walgreens. But if I was teaching my best friend how to coupon, Walgreens wouldn’t be my first pick to send her off on her first run. In couponing, its pretty common to run into bad experiences. Maybe, your cashier gives you a hard time. Or you made a mistake in your math. Or the item for the deal you want to do is sold out. Or you *something* doesn’t quite go as planned. While these experiences will feel discouraging, frustrating and even painful, know that this is completely normal. It’s especially normal for newbies that are just getting into something. It’s not going to be 100% perfect right out of the gate and that’s totally okay! Its a good practice to read and even print out store coupon policies to take them with you to the store. Sometimes, stores will refuse a coupon saying that its their policy, while their coupon policy states otherwise. Stay calm and point it out on their policy if you need. If they still refuse to accept a coupon, you can try taking it up with management or (if necessary) contacting that store’s corporate office. Keep in mind that most coupon policies do state that coupon acceptance is at the discretion of the manager. Either way, you’ll catch more flies than honey! Try to stay pleasant and polite; you’ll get better results (I promise)! Its also important to read coupons. Coupons usually have limits written on the coupon. Know this number. Stick to the limit and you shouldn’t have any problems. Tip: The most common issue for a newbie has to do with the verbiage “Limit Per Purchase” vs. “Per Transaction”. Limit 1 per purchase means you can use at most one coupon per item of the product, not transaction. Limit per transaction or per visit or per person is the total number of coupons you can use per transaction/visit/person. Some inexperienced cashiers will confused “purchase” with the meaning of “transaction”, and try to limit your coupon usage to one. When this happens, point this out to them, and if they still refuse, ask to speak to a manager. 5. Take it Easy on Yourself. When you feel discouraged, give yourself a virtual pat-on-the-pack and say “Great job! You are still learning and already doing so great! I’m proud of you for trying! On to the next deal!” Remember, even $1 saved is $1 you didn’t have before! Truthfully, looking back, I only have one regret, and that is being too hard on myself when things didn’t go well. Whether that’s messing up the math, or picking an unfriendly cashier, mistakes will happen because we’re all human. Also, take it easy. When I started, I would get so stressed out over a deal that I would lose sleep over it, and then I would get sick from lack of sleep. Horrible, I know. That’s why I give this advice from personal experience: take it easy. It’s just a deal. Your health and well-being is MUCH more important. So, learn from my mistakes. Be nice to yourself. If you’re finding yourself becoming too stressed out, take a step back, skip the deal. There’s always a new deal just around the corner – I promise. Also remember that mistakes create the foundation for learning any new skill. When mistakes happen, write them off as being part of the learning experience. Every single person that ever started couponing started at a mistake-making newbie at some point in time. You’re not alone! Go out and do your first deal. Go get ’em, Grasshopper! I wish you great success. I just wanted to say, Thank You! Yesterday was my first newbie trip as couponer. Let me tell you that I was freaking out walking through the isles with my little item list written out just like your blog posts. I noticed pretty quickly that sometimes my deal won’t be the exact deal that you get at your Walmart, CVS, or etc. However, I wasn’t dejected because I still got amazing deals! It just took some calculations and budgeting (iPhone in hand). Walking up to the register I was practically shivering because I had never coupon’d before, but I found that the cashier was really nice and understanding when the “1 Gillette Male Razor” didn’t go through (just as you said – so, I was prepared). She fixed it, and my first trip went off successfully albeit not word for word as I expected. I find the key is just to relax, strike up a conversation, and have fun with it – smile! I did the Herbal Essences, Huggies Wipes, Dawn Dish Soap, Gillette/Venus Razor, and more deals and pretty much stocked up for my upcoming vacation trip and home. You are amazing! I check the website everyday (religiously – really), and I am excited for all of the deals to come with your help. PS: These tutorial videos made me feel like we’re good friends. You’re very warm and personable in your videos. Awww you are so sweet. Thank you for taking the time to write. Your comment totally made my day! lol. You know what? Even I get nervous checking out sometimes. So I think it doesn’t quite go away. But it does become easier with practice. Let me know if there’s anything else I can do. I’m here to answer any questions you need. I monitor YouTube comments really closely and do my best to get them all answered. I’ve made it through all of your tutorial videos, I’ve gone through just about every single link and I have to say I feel exactly the same as Chelle! I was anticipating prices to be a little different, which they were, but not by much so I still got some amazing deals. 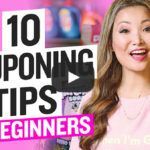 I’ve always loved couponing, I just never knew the right way to stack and do my research beforehand so yeah, I would save a few dollars here and there, but I ended up spending more than I needed to. I’ve asked the few people that I do know who coupon to teach me to no avail. I almost signed up for a couponing class and then I stumbled upon your Instragram. You are the most helpful person! Especially after watching this video, it made me feel so much better about my very first serious couponing haul. I was bummed that a lot of items were no longer available or some of the GC deals were no longer applicable. I spent more than I anticipated, but not only did I get some awesome deals and GC’s, the experience in itself made me feel that much prouder of myself and I have you to thank! Hi, so I have this question. I tried watching your videos to see if maybe my question would be answered, but didnt find any. If I spend $5.98 for both, will I still receive the $5 Extrabucks since my total after coupons was less than $10? Yes you will. The Extrabucks trigger is for amounts before any coupons, including Manufacturers Coupon and CVS coupons. When a deal at krogers is 10 for 10 can I use a coupon on each product? I went on my first coupon trip to Walgreens today to get some Nice! toilet paper and paper towels. Of course the toilet paper is all gone, but I did get a pack of six rolls of paper towels. And just like you mentioned, the manufacturer’s coupon didn’t work. But it is ok. I will find and make more deals! Thank you so much, Tina. First, I want to say your blog and videos are very helpful! I find shopping to be exciting now lol. But, I was wondering how you store your coupons. i clipped mine and now they are on a pile in the table and that was a bad idea because it’s confusing. I’m trying to figure out the best system. Hey Kym. I used to clip mine, but it took too much time. I store them as whole inserts now. Just make sure that you keep them sorted by date so you can easily find them. 🙂 Hope that helps. Thanks Tina it does help!